Süleymaniye (Süleyman the Magnificent) Mosque : built between 1550 and 1557, it is one of the best works of Sinan, the famest ottoman architect. The mosque is part of a külliye, ahuge complex which comprised a school of theology (medrese), arms-houses, infirmaries, caravanserais, a medical school, baths, schools of tradition, a hospital, cells and shops. The inner courtyard is surrounded by porticoes topped with 28 domes supported by 24 ancient columns (2 made of porphyre, 10 of white marble and 12 of granite). 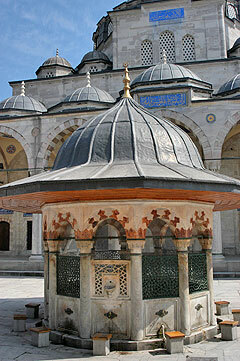 In the centre of the courtyard is a "şadırvan" or fountain for ablutions covered by a pitched roof. The total of ten balconies of the four minarets symbolises the fact that Süleyman the Magnificent was the tenth Ottoman sultan. 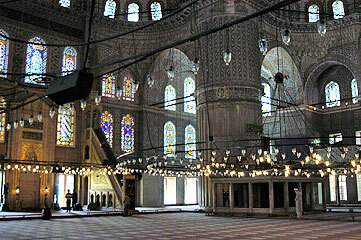 The following lines relate an anecdot about the construction of the mosque: "as the building works had slowed down for a while, rumors, saying that the task was beyond Sinan's capacity, came to the ear of Tahmasb Shah of Persia who sent a chest full of precious stones that should be sold in order to contribute to the construction of the mosque. Sultan Süleyman very much offended called Sinan and told him to take the precious stones and do what was necessary for the mosque. Before everyone's eyes Sinan accomplished the ironical order by crushig the gems to powder and stirring them into the building mortar..."
The inside of the mosque is 70m / 230ft long and 61m / 200ft wide; the central dome with a diameter of 27.5m / 90ft is pierced with 32 windows and supported by semi-domes on the sides. The height of the dome from the ground to the keystone is 47.75 m / 156.6 ft.
Every detail contributes to make this mosque exceptional: its harmonious proportions; the light that comes through the 138 windows; excellent acoustics; beautiful calligraphies executed by Ahmet Karahisar and his pupil Hasan Çelebi; the "mihrab" or prayer niche indicating the direction of Mecca is remarkable for its intricate marble carving; the tiles and stained glasses (only those above the mihrab are original); the "minber" (pulpit); and to avoid the smoke of the thousand oil candles that would have damaged the paintings of the walls, an ingenius ventilation system which drew the currents of air inside the building into a small chamber over the main entrance where the lampback, which was the principal ingredient of the ink used by Turkish calligraphers, could be collected. 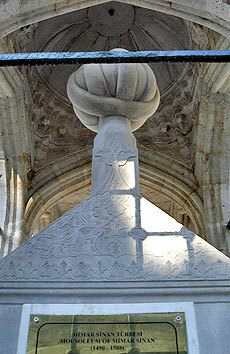 Sultan Süleyman and his favourite wife Roxelane (Hürrem Sultan), as well as Sinan, are buried in the Süleymaniye complex. The Blue Mosque (Sultan Ahmet Camii) was built opposite Haghia Sophia for sultan Ahmet I between 1609 and 1616 by Sedefkar Mehmet Ağa, who was one of Sinan's apprentices. The mosque was part of a complex comprising an hospice, an hospital (insane asylum), a soup kitchen, an open air market street, rental rooms and mansions, a hammam. Most of these sections have been destroyed by fire or razed. The sultan's pavilion where he used to rest before entering the mosque (now the Carpets and Kilims museum), the medrese and the Mausoleum still remain today. 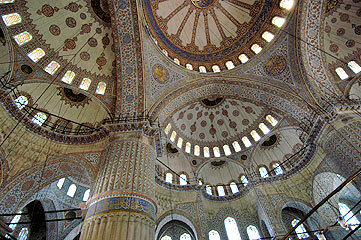 This mosque is one of the last finest examples of Turkish classical architecture. It is said that the pious young sultan who was so impatient to see the completion of his mosque, used to come every friday, the prayer holy day, and help the workmen. 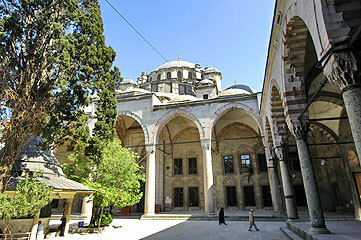 The mosque itself is surrounded on three sides by a broad courtyard. The inner courtyard is paved with marble and lined by porticos topped with 30 domes supported by 26 columns made of pink granite, marble and porphyry. 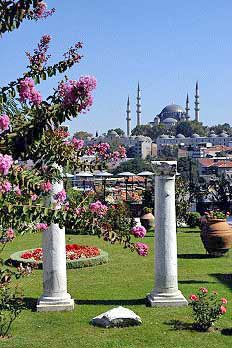 In the centre of the courtyard is a "şadırvan" or fountain for ablutions surrounded by 6 marble columns. 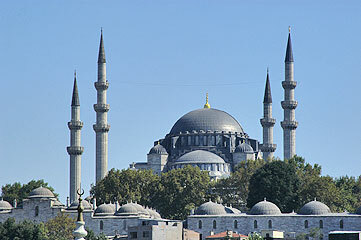 The mosque is unique in Turkey with its 6 minarets. The mosque is called Blue Mosque because of the beautiful 21,043 tiles from Iznik in a dominant blue color that cover the walls and piers. Hyacinths, carnations, roses, tulips and stylized cypresses decorate the tiles. 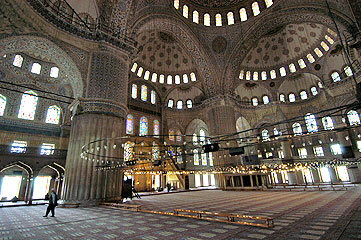 The shape of the mosque is almost square: 51.65m / 170 ft x 53.40m / 175 ft. The central dome at a height of 43m / 141 ft and with a diameter of 22,40m / 73.5 ft and the four semi - domes are supported by four huge fluted pillars with a diameter of 5m / 16.4 ft.. 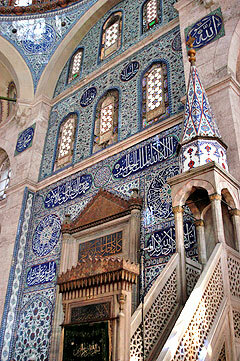 The edifice is also endowed with fine bronze and wooden decorations, and calligraphy work by Seyyid Kasım Gübari. Since the architect was also a master of mother of pearl inlayer (Sedefkar), the inlays on the window shutters and doors exhibit exquisite craftsmanship. 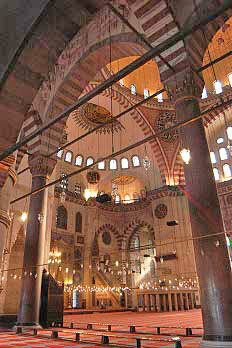 The white marble "minber" (the tall pulpit) and the sultan's gallery and pew are magnificent pieces of work. The stained glasses of the 260 windows are not original. 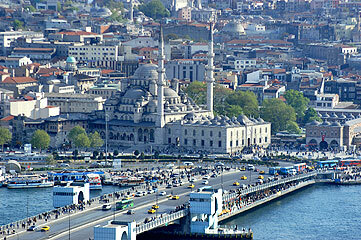 Ahmet I died in 1617, a short time after the construction of his dear mosque was completed. 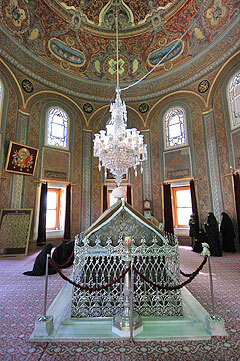 He was buried in the Mausoleum which was completed in the time of his son Osman II. This mausoleum contains 35 other tombs of various sizes with among others, those of Ahmed I's wife Kösem Sultan, two of his sons Murad IV and Osman II. In front of the mausoleum is a 19C marble-faced clock tower and behind is the library. Until the 19th century the caravans of pilgrims to Mecca used to depart from the huge inner courtyard. In 1826, from the great pulpit of the mosque sultan Mahmut II proclaimed by an edict the abolition of the Janissary Corps. Visit is not allowed during prayer time. 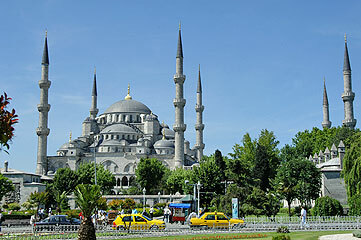 On summer evenings, a sound and light show is presented in front of the Blue Mosque, on the side facing Haghia Sophia. 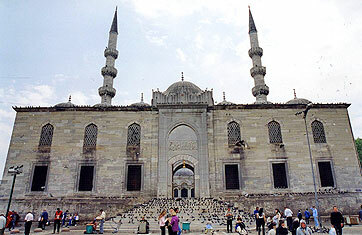 The Prince's Mosque (Şehzade Camii) was built between 1544 and 1548 by Sinan to commemorate the memory of one of Süleyman's sons, the crown prince Mehmet, who was victim of Roxelane, the jealous wife of the sultan. This mosque is Sinan's first truly important architectural commission which he regarded as the best work of his apprenticeship. Like many of his mosque constructions, the Şehzade Mosque has a square base upon which rests a large central dome flanked by four half domes and numerous smaller, subsidiary domes. The mosque was very nicely redecorated in the 18th century. Fatih Sultan Mehmet Mosque (Fatih Sultan Mehmet Camii) was the second mosque to be built after the conquest of the city, the first one beeing Eyüp Mosque. An imperial mosque was commissioned by Sultan Mehmet the Conqueror to commemorate his conquest of Constantinople in 1453. 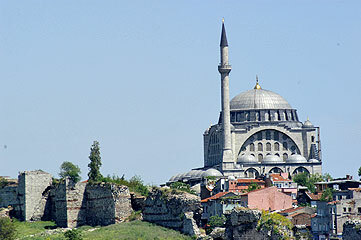 It was built between 1463 and 1471 by Atik Sinan (Sinan the Elder), over the ruins of the Church of the Saint Apostles*. As Mehmet II wished to make his new capital a center of learning, an extensive complex of buildings, the "külliye", was built. It comprised a Koranic school (mekteb), a library and sixteen medreses arranged in two rows of four to the northeast and southwest of the mosque area, which were the first Ottoman educational institutions in Istanbul. Education was no longer based on religious studies only, but now included the rational sciences such as mathematics, astronomy and philosophy. In addition to its educational and religious functions, the külliye also combined economic and social functions with a hospital (darüşşifa), a hospice, a soup kitchen (imaret), a caravanserai and a hammam. The complex was restored by Bayezit II following an earthquake in 1509 but it was severely damaged in the 1766 earthquake. Except for the mirhab, the inner courtyard which was preserved with its main portal, its ancient columns supporting the porticoes and its mosaic of tiles ornamenting the tympanum of the windows on the facade of the main portico, the mosque was demolished at Mustafa III's behest and the new construction was completed in 1771. Although the new mosque bears the specificity of the classical mosques of the sixteenth century with its tall central dome held by semi-domes on all four sides, according to the accounts and sketches of travelers and chroniclers, the edifice lost much of its originality and architectural elegance. The decorative painting of the interior reflects the baroque influence on 18th century Ottoman architecture. In the graveyard on the eastern side of the mosque, the türbe (mausoleum) of Sultan Mehmet the Conqueror was rebuilt on its stone base. 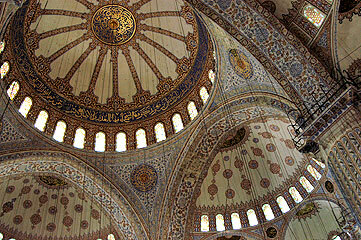 It is a decagonal structure crowned with an imposing dome. 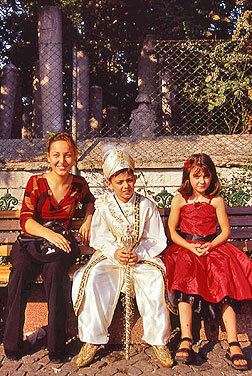 Another türbe is that of Mehmet II's spouse, Sultan Gülbahar. According to different sources, it is said that Gülbahar was a French princess sent to be married to Byzantine Emperor Constantine XI Dragases. When Constantinople fell, she was taken to the Sultan's harem. She gave birth to the future Bayezit II. 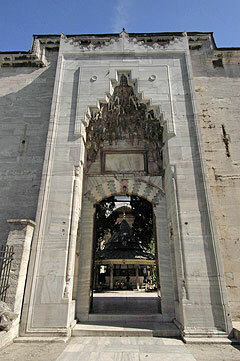 A third türbe was erected for Sultan Nakşidil, the mother of Mahmut II. Her birth name was Aimée du Buc de Rivery and she was the cousin of the French Empress Josephine. She was eighteen when, returning from France to Martinique, she was kidnapped by pirates from Algiers and presented as a gift to Abdülhamit I in 1788. While sections of the hospice, the soup kitchen and the caravanserai have survived, the Koranic school, the library and the baths and hospital have been lost. The medreses have been partially rebuilt or modified for urbanistic reasons. 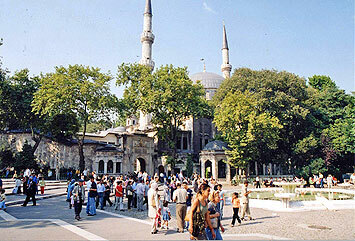 Fatih mosque was the scene of many social movements and revolts. *The Church of the Holy Apostles was originally erected by Constantine the Great and rebuilt by Justinian and his two celebrated architects Anthemius of Tralles and Isidorus of Miletus . The church was the burial place of the first Byzantine Emperors, from Constantine and his mother Helen in the 4 th century, until 1028. The church, consecrated to the Twelve Apostles, held the relics of St. Andrew the Apostle, St. Luke the Evangelist, St. Timothy, the relics of a great number of other saints and martyrs as well as those of the great Patriarchs and Fathers of the Greek Church, St. John Chrysostom and St. Gregory the Theologian. During the sack of Constantinople which occured during the Fourth Crusade, the church and the imperial sarcophagi were devastated and plundered by the Crusaders: most of the reliquaries, the gold and silver vessels decorated with precious stones, the icons, the imperial crowns, the somptuous vestments and other important objects were carried off to Western Europe. In 1454, shortly after the Fall of Constantinople, Mehmet the Conqueror allowed the new Patriarch Gennadios to install the See of the Orthodox Patriachate at the church of the Holy Apostles. But because the church was in a dilapidated state and stood in a district where few Christians lived, the Patriarcate was soon transferred to the Theotokos Pammacaristos Church where it remained until 1586 before moving to St George Church. 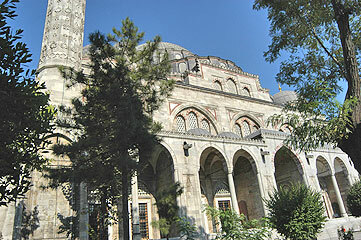 Reused building materials of the church, such as column pieces and stone blocks of the foundations, have been identified in the courtyard of the Fatih Mosque. Beyazit Mosque (1501-1505), located in the neighborhood of the lively Grand Bazaar, reveals a transition style between early Ottoman architecture and classical Ottoman architecture characterized by a central dome held by semi-domes on all four sides. Building materials from Byzantine ruins such as red porphyry columns and marbles were reused in the construction. The mosque was part of a large complex of buildings, the Beyazit Külliyesi built at the behest of Sultan Bayezit II, but only a few buildings and some of the shops remain today. 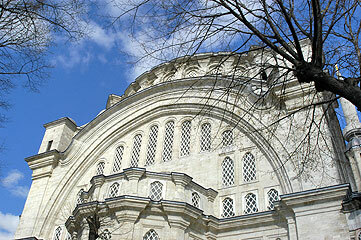 The "mekteb" is the oldest remaining Koranic school in Istanbul and is used as a library. The soup kitchen (imaret) and caravanserai, to the left of the mosque, have become the Beyazit Municipal Library. The medrese has been converted into the Calligraphy Museum. 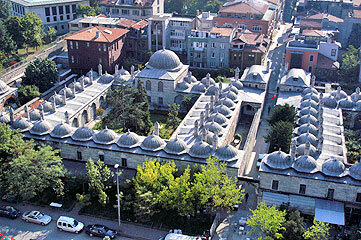 The Hammam, located on Yeniçeriler Road, today houses the central library of Istanbul University. In the mosque cemetery, the türbes (tombs) of Bayezit II and Selçuk Hatun, who was one the sultan's five daughters can be seen. The mosque opens onto Beyazit Square (Beyazit Meydanı) which extends on the site of the Forum Tauri (Square of the Bulls) later renamed Forum of Theodosius where a triumphal arch, erected in 393 during the reign of Theodosius I, was crowned with a statue of the emperor. Today only a few marble blocks and column fragments have remained. To the north of the square Istanbul University and its campus occupy the grounds on which Mehmet the Conqueror built his first palace. After the construction of Topkapi Palace, the palace, from that time named the Old Seraglio (Eski Saray), became the abode of the wifes and concubines who had lost the sultan's favour, of the aged ladies and of the wives of previous sultans. The old wooden palace was demolished by Sultan Mahmut II and the Ottoman Ministry of War and its magnificent gateway were erected on its site. Since the years following the establishment of the Turkish Republic, the neo-classical building was allocated to Istanbul University. Beyazit Tower, the 85 m/ 279 ft high marble tower rising in the gardens of the university, was built at the behest of Mahmut II in 1828, and was used as a fire watching tower. Today, the tower gives a weather forecast for the following day: green light means rain, a red light snow, a yellow light fog, and a blue light sunshine. Between Beyazit Mosque and the Grand Bazaar is the Sahaflar Old Books Bazaar (Sahaflar Çarşısı) where, in fact, books of all kind (old, rare, second hand, new, foreign language books as well as old post cards) can be found. The bazaar contains many shops and an auction room. Rüstem Pasha Mosque: Rüstem Pasha was sultan Süleyman the Magnificent's Grand Vizier and was married to his prefered daughter, Mihrimah, who ordered the construction of the mosque in 1561. 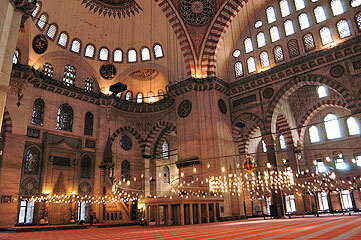 This little gem of a mosque was built by the great architect Sinan. 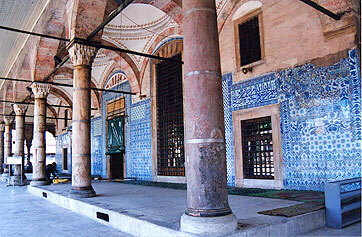 It is covered inside and outside with beautiful tiles from Iznik . Every set of tiles has a different design: myriads of flowers where tulips, carnations, pomegranate flowers are dominant are combined with cloudbands and arabesques. The most beautiful tiles are found outside the mosque and in the mihrab. The trade secret of the beautiful red shade of coral, which was used only between the 16th and 17th centuries, has been lost. The mosque, to which one gets through three different staircases that lead to the terrace courtyard, can be reached through the picturesque streets from the Egyptian Bazaar (Mısır Çarşısı) located on its left. 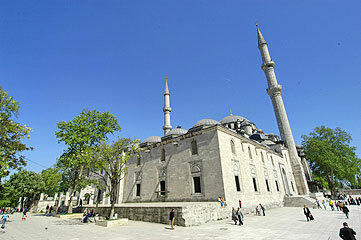 Sokullu Mehmet Pasha Mosque is located behind the Blue Mosque. 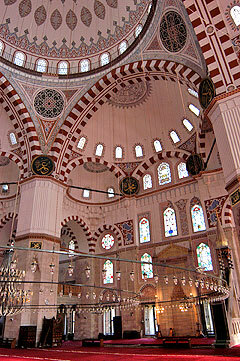 It is another of Sinan's works built in 1577 for Grand Vizier Sokullu Mehmet Pasha. It has beautiful tiles in a dominant blue colour. Mihrimah Mosque(1590) is another of Sinan's work located at Edirne Kapı near the Byzantine walls and St Saviour in Chora (Kariye museum). Mihrimah was the daughter of sultan Süleyman the Magnificent and wife of the Grand Vizier Rüstem Pasha. The New Mosque (Yeni Valide Camii) is located on the left hand side of the Spice Market (Mısır Çarşısı) near Galata Bridge. The mosque, whose construction started in 1597, was ordered for the mother (Valide Sultana in Turkish) of Sultan Mehmet III. Because of the death of the latter, the works were stopped and the mosque was completed later between 1660 and 1663 for another sultana mother, Turhan Hatice, Mehmet IV' s mother. Hence the name New (Yeni) Mosque. The notable fountain for ablutions (Şadırvan) and the imperial pavilion decorated with 17th century tiles can be seen in the courtyard of the mosque. 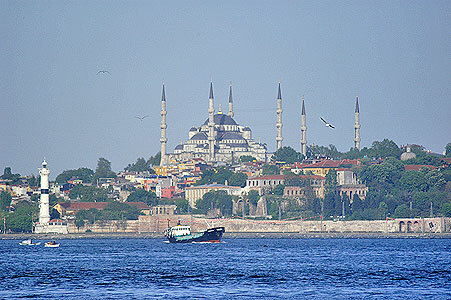 Eyüp Mosque is located near the far end of the Golden Horn. It was built in 1458 by Mehmet the Conqueror on the site where Ebu Eyyüb El Ensari, who was Mohammed's standard-bearer, was killed under the walls of Constantinople during the first siege of the Arabs (672-677). His tomb, which was built in the surrounding walls of the mosque where his grave was found, has beautiful samples of İznik tiles. The mosque that we see today, and that replaces the original one, was rebuilt between 1798-1800 at the behest of Sultan Selim III. 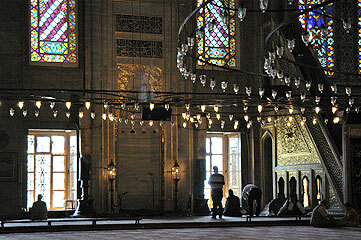 The Ottoman Sultans, after gaining access to the throne, used to have their sword girding ceremonies here. The tomb is a place of pilgrimage and a subject of veneration for the Moslems. 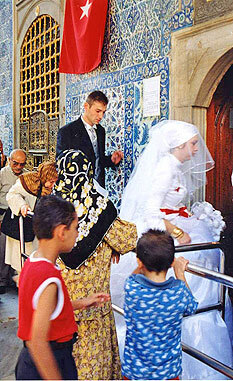 Particularly at week-end, it is the custom to bring young boys dressed in traditional clothing at the time of their circumcision, and religious newlyweds pay a visit to the tomb for blessing. From the mosque, the Café Pierre Loti (french writer Pierre Loti's favourite café) can be reached by walking through interesting Moslem cemeteries. 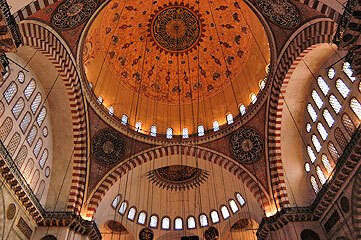 Yavuz Selim Mosque (Selimiye) was built by Sinan on Süleyman the Magnificent's will to honour the memory of his father. 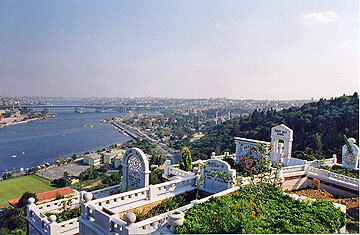 There is a beautiful inner courtyard extended by a terrace overlooking the Golden Horn. Nuruosmaniye Mosque, located near the main entrance of the Grand Bazaar (Kapalıçarşı), is baroque in style.